fanny had a twin sister, a girl whose name has been lost to the sands of time. i don’t know if they were identical or fraternal twins, but regardless, they were apparently not identical in the realm of culinary arts. when a prospective husband for fanny materialized and was to come to the family home for dinner, the nameless twin was pressed into service to cook a delicious meal for which fanny would be credited. this was a good plan, whoever came up with it, for because of this good meal and sisterly kindness, fanny married daniel and i am here today, with the full benefit of daniel’s genes for height and fanny’s for minor falsehoods. 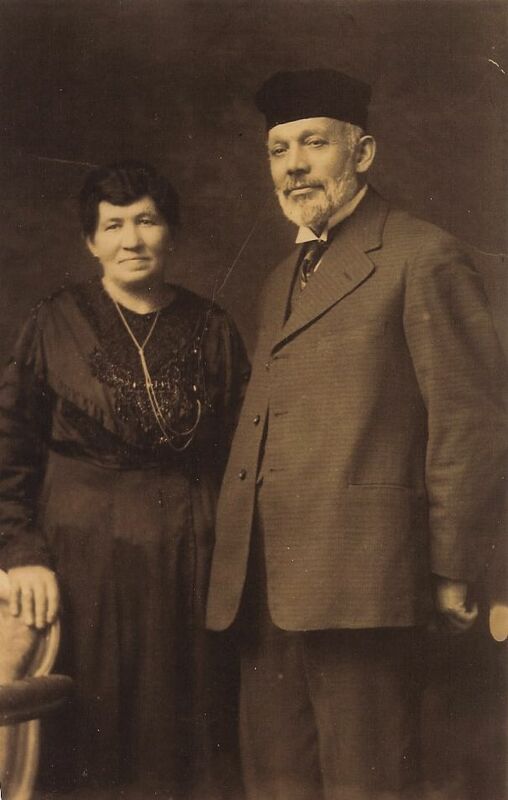 fanny and daniel, my great-great grandparents, came to the united states in the 1880s from a small town in poland called rajgrod. in cleveland, surrounded by a huge extended family transplanted from poland around the same era, they raised 7 sons and 3 daughters, as pillars of the jewish community. though they did not have much money at all, their table was always open to others – as was the rest of their house, where multiple nieces, cousins and sisters lived for at least some small period of time when they needed support. the youngest son, sidney, was the only child to go to high school and when he earned a degree as a mortician, he and his father went into business as undertakers (the hearse was apparently a very popular vehicle for my great-grandfather charlie and his brothers to borrow for dates). the older brothers did not have the benefit of much education at all (though charlie still wrote a beautiful hand, as my grandmother will point out), but with their native intelligence and street smarts began a family-owned salvage and wrecking company in the 1920s, a company that my father and grandfather still ran throughout my childhood. later in their lives, fanny and daniel lived pretty comfortably, perhaps helped out by their prosperous sons and sons-in-law. pictures like this from their circa 1927 golden anniversary, show them in fancy clothes, surrounded by children and grandchildren. many of those children and grandchildren were very tall, and all of them impeccably dressed. last year, i went to my first family reunion ever, where i was surrounded by the other descendants of daniel and his 4 siblings. for the first time in my life, in this room of almost complete strangers with whom i shared the intimacy of my genes, i was not tall but simply average. when we took a group picture, i thought of 1927 and how in this picture, too, many of us were very tall and all of us impeccably dressed. whether i am the only one with fanny’s talent for the white lie remains to be seen. becky– always inspiring…how do you learn about these stories? does your family have a collection of old letters? is it through the oral tradition? katie, i’m glad that you like knowing these things. one day, i am going to put up some kind of chart, so you can see how these people i write about are interconnected. and there are pictures of charlie coming up, so i didn’t want to talk about him here – daniel is my dad’s namesake though, and fanny is auntie franny’s.maura, thanks! some of this information is from my own research and some of it is stories i’ve picked up from family members. my grandparents are full of stories, but you have to ask them the right way – especially my grandmother. I really like now doubting everything you say. I also wish we wore hese hats. I wish I knew this much about my fanily. it gives you such a more certain place and an excuse in ways. I love this project. I will say that every week. i will be really thankful that you say that every week!